After watching Ohio State center Kaleb Wesson dominate Iowa State in the paint two nights ago, Houston head coach Kelvin Sampson clearly vowed not to let that happen against his team, as he sent double team after double team Wesson’s way, forcing the ball out of his hands and to a group of Scarlet and Gray shooters who started hot, but eventually found their level in a 74-59 Cougars win over the Buckeyes. In his final game as a Buckeye, senior point guard CJ Jackson scored a team-high 18 points, while fellow senior Keyshawn Woods scored 10. Together, the two combined to make just five of 16 three-point attempts. Ohio State didn’t get even their first shot up in this game until the 17:36 mark of the first half. Fortunately for the Buckeyes, it was a made three-point field goal by Woods to make it 4-3 Houston. Ohio State’s hot shooting continued with consecutive threes from Kaleb Wesson to give the Buckeyes their first lead of the game at 11-9. Houston had answers, however, as guard Corey Davis scored the next eight points to give the Cougars some elbow room. CJ Jackson dropped in a three and then hit a two-point jumper on OSU’s next possession to cut the Houston lead to 17-16 with 11:34 to play in the half. A three-pointer from Andre Wesson a minute later gave Ohio State the 21-19 lead, forcing Cougars head coach Kelvin Sampson to call a timeout to try and stop the Buckeyes’ 10-2 run. Musa Jallow got into the action 30 seconds later with a three of his own, giving Ohio State a 3-point lead, which would be their largest of the game. It would also be their last lead. Trailing 27-25 with 5:44 to play, Kaleb Wesson picked up his second foul of the half when he was whistled for an illegal screen. Ohio State head coach Chris Holtmann sent Wesson to the bench, and in just over a 2-minute stretch, Houston built a 9-point lead. Wesson was then brought back into the game, but the damage had been done. Houston closed the half on an 18-7 run to take a 39-31 lead at the half. A pair of layups by Jackson and Woods right out of the gate in the second half cut the lead in half, but the jumpers that were falling in the first half for the Buckeyes stopped finding the bottom of the basket in the second. After making 8-of-17 three-pointers in the first half, OSU connected on just 2-of-12 attempts in the second half. Every time the Buckeyes would cut it to four or five points, Houston would go on a run and build the lead back up to nine or 10 points. For every step back the Cougars had, they’d take two steps forward and gain a little more ground every couple of minutes. Eventually, their up-and-down pace wore on Ohio State and tired them out. Shots were left short and one-on-one defense was continuously exploited by Houston’s talented guards. The Buckeyes never got closer than nine points over the final 7:44. Their season comes to a close in the second round of the NCAA Tournament, just as it did last year. This time, however, they somehow did it without the Big Ten Player of the Year. The star here was Houston head coach Kelvin Sampson whose gameplan to double Kaleb Wesson on every post pass was incredibly effective. The Cougars’ physical style worked like body blows, while their pace eventually winded the Buckeyes to the point that their entire game was affected. Sampson had no fear of Ohio State’s shooters and it eventually paid off. + Ohio State missed 30 shots and came away with just six offensive rebounds. The need to rely on the veterans so heavily on Friday night and then again tonight cost them some legs, but Holtmann didn’t really have a choice. The freshmen showed several times over the weekend that they weren’t quite ready to be as collected as they need to be. + For those Buckeye fans wondering where Justin Ahrens has been during the NCAA Tournament, the answer is defense. Both Iowa State and Houston have talented guards who can get to the basket, as everyone saw Sunday. Musa Jallow’s defense and rebounding gets him on the court, and when he’s hitting shots, it can keep him there. + That being said, expect some very good things from Ahrens, Luther Muhammad, and Duane Washington next season. With the new players being added next season, all 3 being 4* players, and with only one starter CJ Jackson graduating, (although Keyshawn Woods [grad transfer] did become a starter at the end of the season, this should develop into one heck of a team next year. Agree that conditioning will play a pretty big part in how far the team can go next year, but I would think, if the “Family” concept continues with Coach H., et al, teaching and driving the incoming potential, it will be a year of Ohio State University basketball we can all look forward to. Go Bucks! 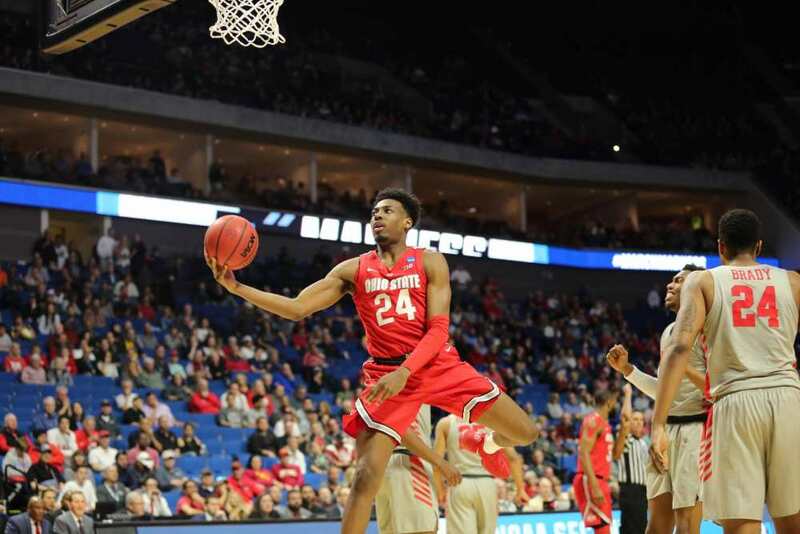 OSU pushing a more talented Houston team for a spot in the sweet 16, exceeded expectations. Even the announcer said that OSU is a team in transition. Our shallow front court was easily exposed forcing OSU into a perimeter game in which for the first half they hit 3 pointers consistently. When Caleb Wesson is forced to shoot mainly behind the arc, we knew this would be a tough one to win. Hats off to our coaching staff, last year we lost the B1G player of the year and 3 talented seniors and that’s from a group of players recruited by Thad who exited early. We all need to be excited when the talent of recruits matches our coaches ability and vision. Best of luck to the Buckeyes’ graduating seniors! Wishing you all a bright future wherever it leads for you. Looking forward to next year. I think Holtmann overall did the best that could be done with this team’s skill level, and with the incoming recruits along with one promising redshirt transfer, the 2019-20 season could be a great one to see. This team did better than I thought let alone making ncaa tourney,I’m proud of the effort they gave!I’m looking forward to next year!Go Bucks! I’m glad Jackson is gone. I hope Andre gets stronger and better Kaleb keeps his head on straight. I’m glad to see a fresh high ranked class coming in. This Houston team was everything written above and quicker & tougher than the BUCKEYES. Coach Holtmann inspired them at halftime to be more intense and they were, but making shots makes basketball a heckuva lot more fun & rewarding. Hope that coach has the offseason planned for improving your total game, get stronger, incorporate the new recruits and think when you play pickup games. Thanks to all the seniors and coaching staff. This team didn’t have the talent/experience to be in the 2nd round of March Madness! OSU missed it’s only true chance to turn the tide at the beginning of the second half. 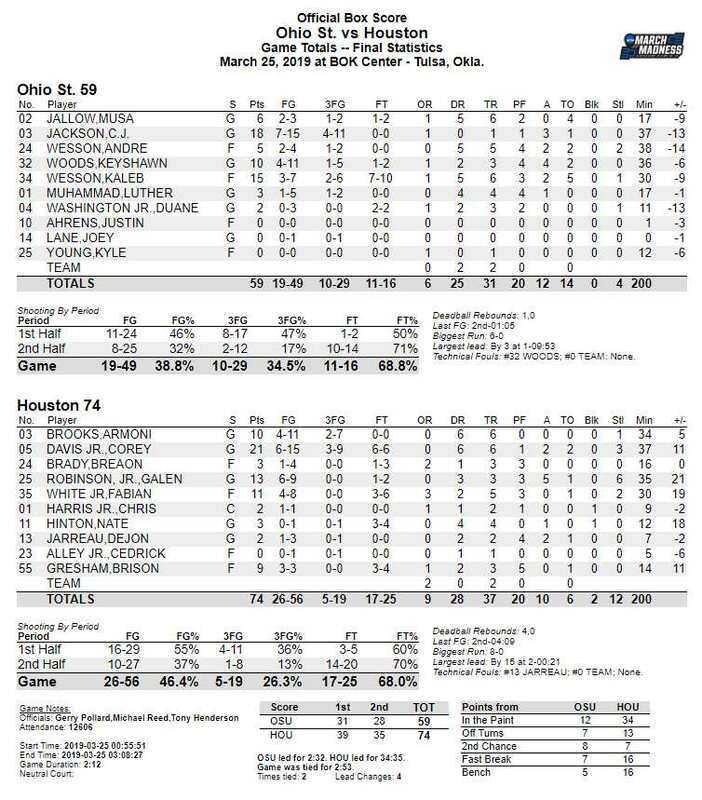 Houston was cold ( 5 for 17 from the floor I believe), and dared OSU to pull even with them, essentially selling out to deny Wesson. OSU responded with…not much at all. A 20-15 season ends. Hopefully, the returning players can improve and mesh with next year’s good class for a better brand of basketball. Up until the final TV timeout (way too many TO’s in basketball) of the 1st half the Buckeyes played a fired up brand of basketball. After that break they were done. The basketball team needs to spend the offseason in the weight room with the football players and Coach Mick. Not going to complain. Against all odds they made it to the round of 32. Houston is a good team. It was kinda interesting watching how the Cougars spared their main starters . They’ll be fresh for next. Totally agree regarding the weight room!